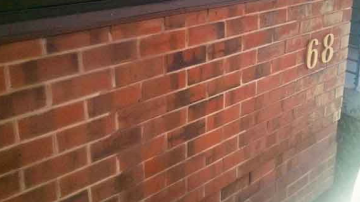 More gentle than sandblasting and other types of high pressure cleaning, abrasive blasting is ideal for use on softer stones like sandstone, bluestone limestone and masonry. 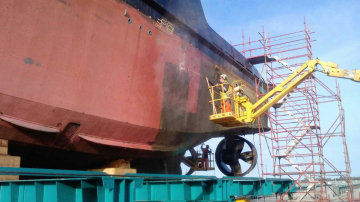 Wet abrasive blasting, sandblasting and dustless blasting services in Adelaide for ships, boats, decking, machinery and marine structures. 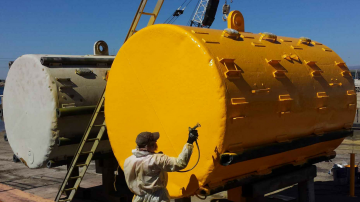 AEB provides a complete range of protective coating services in Adelaide, for marine vessels and structures, machinery and equipment. AEB wet abrasive blasting and sandblasting removes all types of road and pavement markings from surfaces, cavities and depressions. We operate across Adelaide and throughout South Australia. AEB wet abrasive blasting, sandblasting and dustless blasting prolongs the life of Adelaide industrial, mining and agricultural equipment. 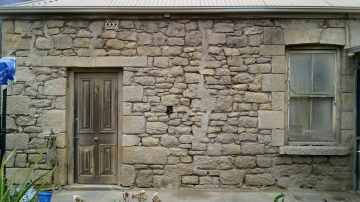 Australian Enviroblast wet abrasive blasting, sandblasting and dustless blasting quickly and effectively removes graffiti in an environmentally-friendly way. At Australian Enviroblast, we use the revolutionary and technologically-advanced Quill Falcon Precision Dustless Kwikblast® System. 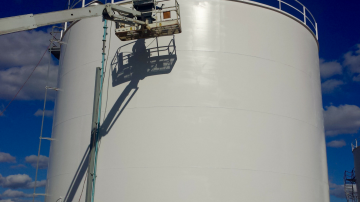 This means we're able to remove a wide range of coatings, corrosion and residues from all types of structures, locations and equipment, while leaving surfaces clean and contaminant free. 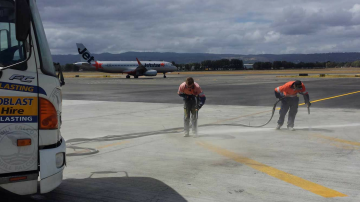 With a fleet of mobile equipment, Australian Enviroblast is able to carry out on-site abrasive blasting and industrial coating, and offers efficient, flexible and cost-effective solutions that deliver outstanding results on both large-scale and more intricate, delicate jobs. Abrasive blasting (sometimes known as sand blasting) is a safe, environmentally-friendly and cost effective way of removing rust, grease, paint, stains, and other types of coatings, corrosion and residue from almost any type of surface. Australian Enviroblast was founded in 2009 by Mark Chiappin with the aim of introducing environmentally-friendly abrasive blasting services to Australia. Using the revolutionary and technologically-advanced Quill Falcon Precision Dustless Kwikblast® System, the Australian Enviroblast team of trained and skilled operators is able to remove a wide range of coatings, corrosion and residues from all types of structures, locations and equipment, while leaving surfaces clean and contaminant free. We have vast experience of jobs both large and small, in the commercial and the domestic fields.